1. An ethical purchasing policy worthy of its name should not consider companies that benefit from war and occupation as ethical suppliers. I will work to change MEC's policies to reflect this. A bit of MEC's recent history with member resolutions has informed my views of what the next steps are for solidifying the co-op's commitment to social justice. MEC was the subject of controversy in 2009, when members presented a resolution at the Annual General Meeting, proposing that the co-op stop carrying products made in Israel. The proposal was a part of an ongoing Boycott, Divestment and Sanctions campaign that was called by 171 Palestinian civil society groups, centred around three demands: an end to occupation and a removal of the wall, equal rights for Palestinians in Israel, and the right of refugees to return home. At the Vancouver meeting, opponents of this proposal outnumbered its supporters, and it was defeated. ...we do not divide our supply chain along political lines. In short, we will not take sides in the Israeli-Palestinian conflict. Our human rights efforts are squarely focused on our supply chain—on working to improve the factory conditions and treatment of the workers that make MEC-brand products. As much as this is cowardice to some or a sell out to others, it is our conviction and our intent is to not veer from this belief. Chan did not mention the name of one of MEC's suppliers, Haifa-based Source Vagabond. In its own words, many of the manufacturer's staff are "experienced ex-officers of elite IDF (Israeli Defence Forces) units" and they proudly supply the IDF and the US Marine Corps. Their hydration systems have names like "USarmy TACTICAL 3L," "ASSAULT," "COMMANDER," and "STRIKE 3L." 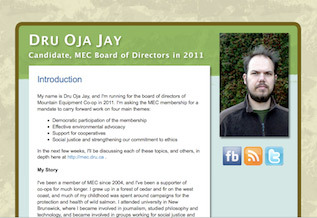 Speaking as a candidate for the board, I don't believe that it is the role of board members to change MEC's policy with regard to a single country. That kind of decision needs, minimally, the support of a plurality of the co-op's three million members. I do, however, believe that the board has a mandate from the membership to set high ethical standards for selecting suppliers. More on this below. The approach of the management to the controversy is quite understandable, from their perspective. A polarized internal debate has the potential to embarass the co-op, create PR problems, and distract from existing priorities. However, I believe that an approach that views a passionate membership as a gift, and embraces participation as the solution and not the problem, is ultimately the right and truly cooperative approach. We should be proud of what makes co-ops distinct from their corporate counterparts. Chan did the minimum in highlighting MEC's "obligations" to its members, but MEC's overall stance was defensive. Why not take the opportunity to explain that beyond obligations, member participation is what makes co-ops one of the most democratic and equitable ways we know of to manage economic activity? Organized and well-facilitated debate among the membership is the only way members can participate meaningfully in decisionmaking in a three million-member co-op. Concretely, the members need more than a few hours a year in a room in Vancouver to discuss these issues amongst themselves. MEC should open the communications channels and let members speak to each other. Such an opening would present many challenges, but they are far from being insurmountable. A system that gave increased prominence to proposals supported by more members, for example, would do a much better job of filtering out disruptive resolutions than the limiting measures passed at the 2010 AGM. On a common-sense level, ethics on the one hand and benefitting from war and military occupations on the other do not seem to go together. In MEC's current ethical purchasing policy, they do go together. Few institutions of MEC's size have any ethical purchasing policies at all. Many have little in the way of ethics in general. We are fortunate that MEC is as good as it is, but we can do better. I propose that you can benefit from war and occupation, or you can be considered an ethical supplier, but not both. The principle should apply regardless of the country of origin. If a Russian arms manufacturer benefitting from the military siege of Chechnya makes really nice sleeping bags, MEC should find another supplier. If a Lockheed Martin subsidiary manufactures quality hiking boots, or a factory owned by Filipino paramilitary leaders make great socks, same thing. Arms manufacturing is a major, fast-growing industry in Canada; they should not be exempt. The ethical purchasing policy could be improved in many ways. Of those, war and military occupation are the least compatible with MEC's goals. Both result in death and destruction. Both have massive environmental impacts, from fuel consumption to oil and chemical spills to depleted uranium contamination. Without a doubt, war and occupation keep people from enjoying self-propelled outdoor experiences. For those reasons, separating ethics from war is the right place to start improving the purchasing policy.